The EU Bailout Fund for countries in financial problems called the European Financial Stability Facility has been created in may 2010. The EFSF lends on the financial markets by issuing bonds. These bonds are of the highest quality because the money is guaranteed by AAA-countries (with the highest credit ratings in the world). These countries are: Germany, France, Netherlands, Finland, Austria and Luxembourg. ''EFSF 1.0 (which is the current version) uses an absurdly complicated combination of prepaid interest, cash buffers, overguarantees and the like to ensure that all its debt issues are backed by triple-A guarantees or cash. EFSF 2.0, expected to be ratified this fall, makes things (relatively) simpler. 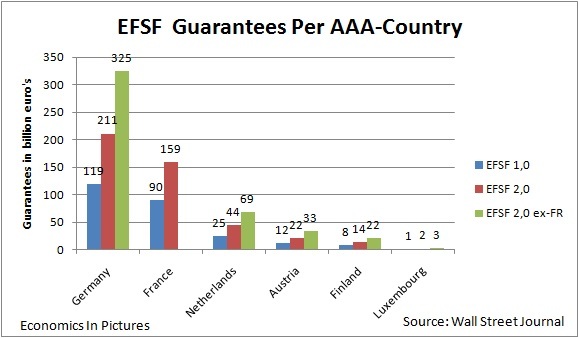 In total the EFSF 2,0 requires 450 billion euro's of guarantees by AAA-Countries. If France loses it's AAA-rating the other countries see their guarantees raise by 54%.